Heel pivots without foot target. 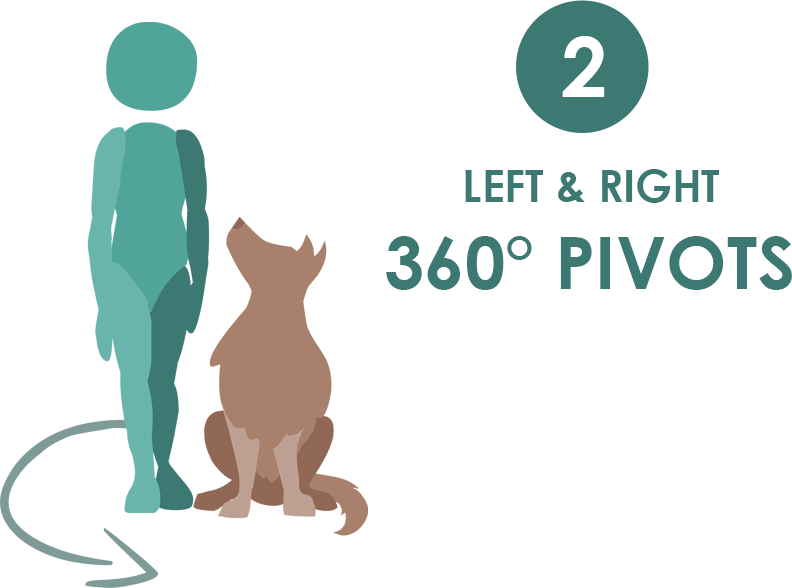 Dog and handler pivot together on a single spot, turning 360 degrees to the left and right, without the aid of a foot target. Purpose: Maintaining a basic position at the handler’s side when moving is paramount to heeling. Exercise set-up: Handler calls the dog to heel position, or simply moves to the dog’s side. The exercise begins when the handler cues the dog to begin moving. The handler moves slowly and smoothly while pivoting. Movement to the right and to the left must be clear. The handler’s feet should move as if they were on a dinner plate, rotating in a single spot. The handler may halt between directions, at which point the dog may sit or stand. The handler may re-cue at the change of direction. Each direction should demonstrate slow and controlled movement. The exercise ends when the handler completes both directions and releases the dog from position. Non-qualifiers: Handler pivots so quickly that the dog is unable to maintain parallel position. Multiple cues within a pivot direction. Walking a circle instead of a pivot (handler deviates more than a few inches from the starting spot). Handler uses body help (shoulder/hand movement) to assist the dog. Dog is more than 30 degrees out of heel position at any given time during the pivot. Video does not permit the exercise to be adequately judged. Tip: We strongly recommend placing a piece of tape or a visual target on the ground to ensure that you stay on one spot. If you walk a small circle instead of pivoting on a spot, you will not pass this exercise. Think: dinner plate! If your dog is not backing up to stay in position, then you are walking a circle rather than showing a pivot.